A great way to have a tasty dessert without the pastry. Added bonus of being quick to prepare, you’ll have most of the ingredients on hand, and pretty much guaranteed to be a winner with the eaters. Mr MWCED had picked some of our end of season apples, better we have them than the possums! Or the dog; she loves to play ball with an apple and then when tired out will stretch out on the lawn and eat every last bit. Our apples are definitely cookers, quite tart. I think tarter apples will work best in this recipe, but if a sweeter apple is all you’ve got then use and enjoy. The apples burst out of the skin, are very very soft, and the topping is Delicious. Add cream, yoghurt or ice-cream. Mr MWCED and VFF (very fabulous friend) enjoyed maple and walnut ice-cream on the side, I had a little dairy-free coconut ice-cream. Both went well. (the original recipe had 3 tablespoons of cream, which would give a more caramel sauce, however I didn’t use this as ‘trying’ to do low fat (haha). Combine all the ingredients except the apples in a large bowl. Add the apples and turn to coat. Place the apples cut side up in a baking dish lined with baking paper and spoon over all the mixture left in the bowl. Roast for 30 minutes, basting the tops every 10 minutes, until the apples are very tender and caramelised and the flesh is pulling away from the skins. Add a splash of apple juice or water to the dish if needed to ensure there are lovely caramel juices for serving. (original recipe from dish magazine – a great site! Even if you aren’t asked to bring a little something I was always brought up to take a little or large ‘gift’ along when visiting. It might be bounty from the garden, or something delicious you have baked. But whatever it is, as the recipient it is always hugely appreciated – and not always for the item itself, but for the thoughts and time that went into the gift. The biggest problem is often trying to think of what to take. You don’t want to take something that might not suit the occasion, or match the food that your host has prepared. This is where the magic of Sugary Spicy Candied Nuts comes into play. They are just perfect, maybe too perfect. Because the temptation to keep eating them might just spoil the appetites of all those guests! “Just one more” turns into “Just one Handful More”……. We are blessed with the bounty from an old walnut tree. Don’t be surprised to see other walnut recipes turning up here. Over the years we have found many ways to enjoy these nuts. We love them, and so does our dog, Belle. Belle is a fiend at checking out the nuts that have fallen to the ground, knowing exactly which ones are edible and which aren’t. If only she would pick them up gently and put them into a container, instead of cracking the shells and eating them herself! 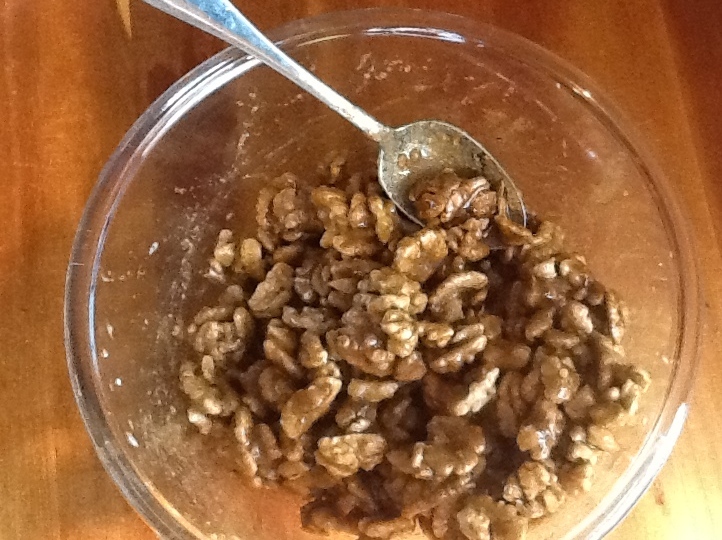 I have roasted walnuts a number of ways, mostly spicy, and mostly always tasty. But to my mind these are the very best. Totally more-ish, totally bad, totally totally good! I found the recipe on smittenkitchen.com for sugar-and-spice candied nuts. I have tweaked it a little, but thanks to smitten kitchen, which is a great blog. What are your favourite food blogs? I took this recipe from Smitten Kitchen, who in turn notes it is adapted from Elizabeth Karnel of Hill Country. The recipe below is my version, have made a few tweaks. Preheat oven to around 165 celsius. Mix sugars, salt, cayenne and cinnamon, making sure there are no lumps; set aside. Beat egg white and water until frothy but not stiff. Add walnuts, and stir to coat evenly. Sprinkle nuts with sugar mixture, and toss until evenly coated. Alternatively put them all together and mix – quicker and less bowls to wash! Spread sugared nuts in a single layer on a baking sheet lined with baking paper (I use the roasting pan). Bake for around 30 minutes, stirring occasionally. Remove from oven and separate nuts as they cool. Try not to eat too many. 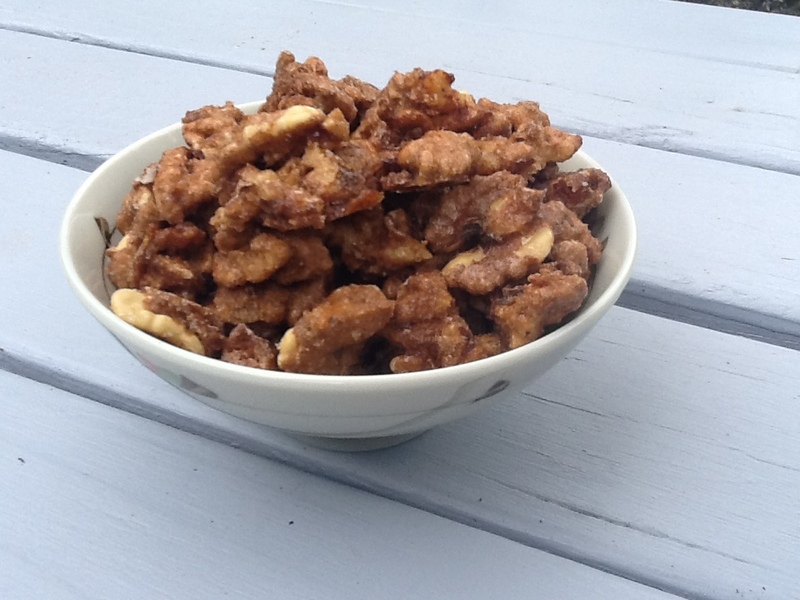 When completely cool, pour the nuts into a bowl, breaking up any that stick together. Have a competition as to who can guess how long they will last. So, invite us around, you just might get a bowl of nuts!